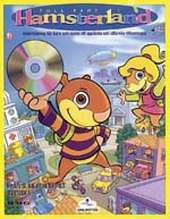 In "Full speed in Hamsterland", you hang on with the taxi and greet the lovely hamsters in Hamsterland. Visit the airport, petrol station, hospital, supermarket, fountain square, main street, forest, harbor or any of the other places. In every place you can click on a lot of things. If you do so, one voice will talk about what it is and the word will be written on the screen. Some words are a little difficult to understand for the really young children (the game is recommended from 3 years). Examples of difficult words are ambassador, mayor, CEO, aerobics instructor and from the ktkapte (is not enough with the captain?). When you click on the items or the figures you will also see what and in what way they are used, what the person in question does or something else exciting. For example, if you click on the helicopter at the airport, it will fly away. The animations in the program are very good with lovely graphics. It is actually a joy to see some of them. An awesome thing is the X-ray machine. With it you can see what's in the underworld, in airplanes, behind doors and much more. If you click on the building company, you can build your own dream home. The graphics are brilliant and the detail high. The other games are not as good. In addition, they are quite difficult and definitely do not fit 3–5 year olds. With the trawler you fish - fish the right number of fish of any kind, but beware of sharks and other fishy fish. In addition, you can visit the cannery and pack canisters. Here, however, the tempo is too high for the smallest.